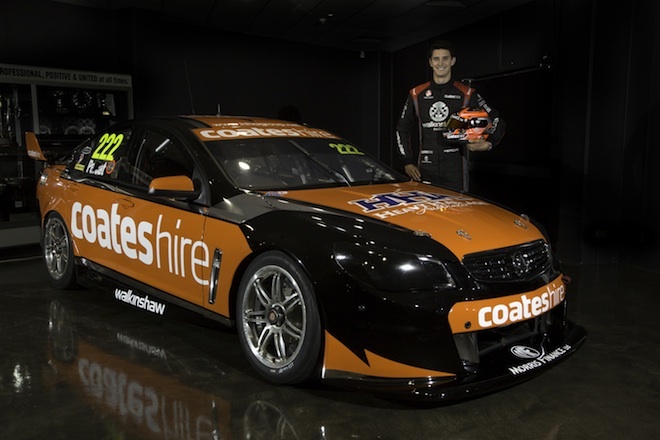 The look of the 2014 Clipsal 500 grid is now complete with Nick Percat unveiling the Coates Hire-backed Walkinshaw Racing Holden. The equipment hire firm has taken title sponsorship of the #222 Commodore for the Adelaide and non-championship Albert Park events. Heavy Haulage Australia is already confirmed to sponsor the car from the second points paying event at Symmons Plains until the end of the penultimate round at Phillip Island. Coates has backed Percat over the last three seasons in V8 Supercars’ Dunlop Series and the Carrera Cup Australia. The 25-year-old Percat appeared to rescue his career last year in the Porsche championship, shaking off a lingering fast-but-erratic tag with an impressive run to second in the points standings. The start of his first full-time V8 Supercars Championship campaign comes after subbing for the injured James Courtney in the sister Holden Racing Team outfit at last year’s Sydney finale. “This is the culmination of many years of hard work and to be driving in the full championship for Walkinshaw Racing is a dream come true,” said Percat ahead of the weekend. “I am also thrilled to have Coates Hire continue their long association with me. “There is no doubt this is the biggest challenge I’ve faced in my career and I can’t wait to get over to Adelaide and onto the track for the first time. Percat has past experience of the Adelaide circuit in Aussie Racing Car, Formula Ford, V8 Supercar and Porsche machinery. He has been backed by the Walkinshaw empire since his debut Formula Ford season in 2007, winning the Bathurst 1000 for the squad alongside Garth Tander just four years later. The #222 Commodore is the chassis used last year by Tony D’Alberto and will be engineered by ex-Nissan Motorsport chief designer Alex Somerset.